Made up of news footage and what became known as White House TV, ie. footage shot by the Reagan administration, The Reagan Show is a look at the Reagan presidency in a way that reveals a very human side to both Ronnie and Nancy. 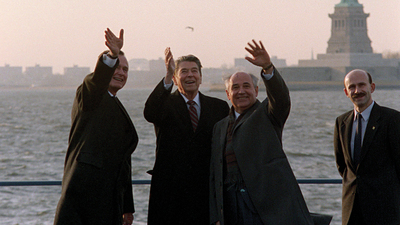 Largely focusing on Reagan’s struggles to bring down the number of nuclear missiles the film marches us through the Regan years at speed giving us a look at what happened and who many of the players were. What is interesting is the supporting cast of players who cameo, Newt, Pat Buchanan, Joe Biden and a few others are seen here and there. Interesting other people who were once big players (Heads of conservative groups) make you look at the screen and wonder why in the hell did anyone listen to them. Because it begins with a title saying that the Reagan’s shot more footage than the previous five presidents combined I was left to wonder why this film is only 74 minutes long. Full of tons of fly on the wall material and a real sense of time and place this film should be two or three times longer than it is. This is one of the few presidential docs that really adds to what we know and changes how we think about them. The only thing I can think of is that the Reagan family/Library refused permission to delve deeper into other areas of Reagan’s administration such as Iran/Contra. It should be noted that one of the strengths of the film is that it shows us how the world changed in regard to Presidential coverage. We see all of the normal things that we now take for granted with tight control of the image beginning here. Watching the film you can’t help but think of Donald Trump and see how badly he shapes up to Regan and his crew. Regan and his bunch made it all look so easy- especially the pleasant way they deny or counter allegations. Trump should watch this and learn something.